This product has now been discontinued, please see FT245BL for a drop-in replacement. 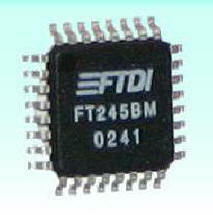 The FT245BM is the 2nd generation of FTDI's popular USB FIFO device and the FT245BL is a lead free version of it. The FT245BQ provides the same functionality as the FT245BM and FT245BL in a QFN-32 lead free package. This device not only adds extra functionality to its predecessor (FT8U245AM) and reduces external component count, but also maintains a high degree of pin compatibility with the original making it easy to upgrade or cost reduce existing designs as well as increasing the potential for using this device in new application areas.